Imagine being less stressed, more focused, and happier every day of your life. 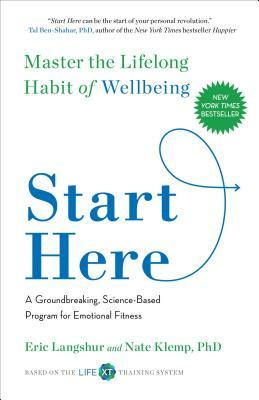 Start Here outlines a program designed to help you do just that by cross-training the skill of lifelong wellbeing. If given the choice, we would all choose to be less stressed, to feel happier, and to experience a more optimal state of wellbeing. So why are these outcomes so hard to achieve? The answer is quite simple. No one has taught us how. It turns out that just as you train your body for fitness, you can train your mind for wellbeing. We call this Life Cross Training (LIFE XT), and Start Here is the manual for anyone seeking to achieve emotional fitness. Combining ancient wisdom with modern neuroscience from the world’s leading experts, LIFE XT is a groundbreaking training program to master the art of wellbeing. The program teaches practices proven to rewire the brain for increased focus, engagement, and resilience to stress. By offering specific practices, habits, and assessments to manage your training and by helping to build up core skills such as mindfulness, gratitude, and compassion, authors Eric Langshur and Nate Klemp lay out a thorough and sustainable program that anyone can integrate into their daily lives. These are benefits we all seek and can all experience by cross-training with the scientifically validated practices presented in this book. Want to become less stressed, more emotionally fulfilled, and more in harmony with the world that surrounds you? Start here. Eric Langshur, a seasoned corporate executive and entrepreneur, is the founder of Abundant Venture Partners. Years of research into the intersection of philosophy and neuroscience have established him as a thought leader in optimizing wellbeing. Nate Klemp, PhD, is a Stanford-Harvard-Princeton trained former philosophy professor and an expert in understanding how the tools of ancient and modern wisdom can be used to improve individual wellbeing. They have founded Life Cross Training together to foster a greater sense of wellbeing at work, home, and in all areas of life.